I recently returned from what, on paper, was an expensive adventure debacle. Despite a “fail” in my original quest – reaching the summit of one of the world’s seven summits – I learned a much more important lesson on the value of friendship and compassion, as well as the importance of good old face-to-face conversation. For the first time in years, my laptop, iPhone and all things wi-fi and social media were totally useless and irrelevant. Getting back to Base Camp, or Plaza Argentina, went well enough considering my wobbly legs and altitude-induced exhaustion. That’s where the real problems started. The camp doctor confirmed what my guides and I knew – I would quickly feel much better at a relative “low” elevation of 14,500 feet – but should get off the mountain as quickly as possible. That made sense, but it quickly became clear that would be as difficult to get off Aconcagua as it was to get to and up the mountain. Book a flight on the Aconcagua Park helicopters. The advantage here is speed (15 minutes flight time to logistics center and hotel at base of mountain) with negatives being high cost (don’t ask) and total unpredictability of timing due to the notorious mountain winds. Book a “carry” mule to take you back to park entrance. Advantage is you don’t have to hike, or carry your massive pack, but negatives are timing; 3-4 days delay to get a carry mule up to Base Camp and then 2 days or so to hike/ride back down. Also not cheap. Book a mule to carry our packs to park entrance. Advantage is we can guarantee departure in 1-2 days, but cost is mixed (need to pay for mule and time spent in Base Camp) and this would require my guide to return to Camp 3 to retrieve his gear, and then hike back down to accompany me to the park entrance. Did I mention this is a grueling 12-hour hike, even accounting for the lighter daypacks and downhill grade. Stay at Base Camp for perpetuity drinking $20 dollar beers and avoiding showers. I chose the helicopter option. But not so fast…things happen on their own time on the mountain. The timing of the helicopter flights is totally unpredictable; the notorious, screaming winds on Aconcagua often make it too dangerous to fly. As it happens I was on stand-by, fully packed and ready to go, for about 30 hours. 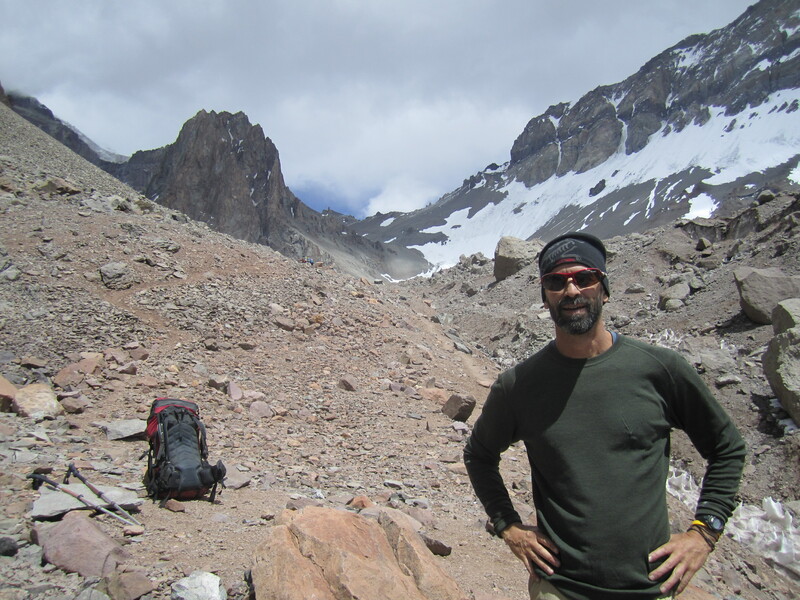 That delay was costly, since Plaza Argentina is like most mountain base camps – a global village where costs for limited services are often astronomical (e.g. $40 cash for a meal, $10 for a Pepsi.) Finally, the weather broke and I was able to leave Base Camp with a park helicopter almost 32 hours after I arrived. I was too happy to realize I was petrified during the ride, but let me say I now know what it feels like to fly a helicopter in bumpy, fierce cross-winds mere feet from mountain peaks. (I can take that one off my bucket list.) Finally, back to civilization…sort of. The helicopter and a quick car ride by a local support team got me as far as a small hamlet of hiker hotels and restaurants on the main highway, roughly halfway between Santiago and Mendoza. Though this area is a staging area for many expeditions, it’s a desolate and isolated place. Thankfully, I found a hotel that served as unofficial home to climbers – and a great place for a hot meal and shower. My challenge, despite the new comforts, was to try to get a bus ride to Santiago to catch my flight home – a seemingly simple proposition since I was on a the main highway crossing between Argentina and Chile. But things are not so simple in Argentina. Due to the Christmas holiday timing, nothing moved (and no phones were answered) for roughly 24 hours. Then the hotel staff discovered that very few of the bus lines stop at this particular spot on the highway. Well, thanks to the help of the friendly staff at my hotel, I eventually booked a seat on a small, stuffy mini-bus and made my way to Santiago. I thought I was in business when I noted the very loud, very old video players booming old Guns & Roses videos in the bus. But then the smoking started. And little did I know the route would actually go right over the spine of the Andes. Let me say that I have never, that I recall, been more afraid for my life than during the roller-coaster drive through the steep, sinewy ravines they consider a highway. The area around Portillo (a ski resort for hard-core skiers wanting snow during the North American summer) was something like a scene out of Lord of the Rings, with gigantic, jagged peaks looming (precariously) over the highway road. Local drivers shifted lanes with abandon, apparently not concerned about either gravity or the hundreds of rickety trucks coming from the opposite direction. Other passengers informed me calmly that this stretch was notorious for rock falls and traffic fatalities. After my white knuckle ride, I found myself in a Santiago bus depot about 20 miles from the airport…and with a very tight window to catch my flight back to the U.S. Thankfully, a Chilean version of a guardian angel – an honest taxi driver who claimed to be a former auto racer – helped me get my luggage and got me to the airport in 15 minutes. Many rules of the road were ignored and broken during this harrowing drive, but I made it safely. Once at the airport, things began to fall back into place: check-in, security, coffee, boarding and the relative security and comfort of a flight home. As noted, the best part of this story is not that I eventually got home safely – though not in the time or fashion that I expected – but that every step of the way was due to the effort, ingenuity and support of people along the way. My tools of the trade were conversation – often in broken Spanish or variations on tourist mime – and reliance on the incredible friendship and assistance of strangers along the way. I did use technology a couple of times – notably a fax/phone at the hotel – but that’s about it in terms of my usual communication tools. And I think it was good for me. The lesson: communication is about people, not the technology or tool. I wanted to let my readers know that I’ll be relatively silent for about two weeks. I’m off to climb Mt. Kilimanjaro with some friends and expect to have little or no Web access during my trip. Check back in a couple of weeks for more musings on the wonderfully wacky world of public relations. Thanks for your support. I just returned from a one week trip to various locales in Ontario to visit family and let the kids meet some of their cousins. Nothing dramatic to report really. There is still plenty of good things I love about Canada – the decorum of politics, the cosmopolitan restaurants, the peerless museums and the prominence of hockey – and some things that I don’t like as much – such as the European-influenced propensity to smoke furiously, the frustrating strikes by quasi-governmental workers and the glaring lack of choice across a range of services (no HBO!?!) I didn’t have time to meet with former colleagues in the communications field, so no great observations on the reaction to the Web 2.0 revolution. I can report, however, that the major newspapers and national broadcast news programs are still exceptional and refreshingly free of bombast and bias. Nice to see there is a world beyond Bill O’Reilly and Katie Couric. Much has been written and said about the inherent power of crowdsourcing, or the collective merit of millions of individual online users collaborating or contributing their opinions and knowledge. The reality of this theory really came to me during research for my upcoming trip to Kilimanjaro. As I confirmed my travel arrangements, it became clear I would have to spend the night at Nairobi’s somewhat notorious airport. So I started an online search to try and find out the do’s and don’ts, and any realistic sleeping options. Not surprisingly, the formal sources (airport website, Kenyan Airlines) had little relevant information – unless you count laudatory and useless promotional materials. But I found several sites where customers had posted their comments and advice, including this one. Though individual comments or suggestions in isolation were of limited use, I was able to get a good, credible picture of my options (and of the definite “don’ts”) by scanning a number of comments. (I was able to confirm that there are sleeping quarters in the airport, what they cost, where they are located and even the best location for a quiet night.) Up to several years ago, it would have been difficult if not impossible to find this information. Just another example of the power of the Web, and of the collective widsom of online citizens.